Our national study of Australian Generation Z teens (those born around the mid-1990s to mid-2000s) showed teens who had been exposed to education about diverse religions and worldviews were more tolerant of religious minorities, including Muslims and Hindus, than those who hadn't. Such classes are often a distinct subject in Catholic and other religious schools in Australia. But government schools don't typically provide opportunities to study diverse worldviews. They may provide limited content in some humanities subjects, such as history. 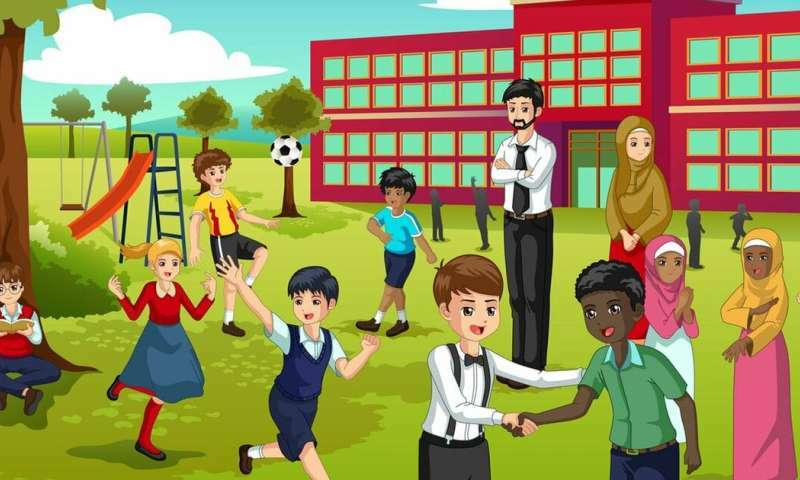 In the mid-2000s Australia's public secular schools had few opportunities to provide teaching about diverse worldviews and general religious education. Victoria prohibited teaching about religion until 2006 but allowed volunteers to deliver special religious instruction in school hours until 2015. Victoria's 2015 iteration of the new curriculum included – for the first time – two dedicated sections on learning about worldviews and religions in humanities and ethical capability. The emphasis is on Australia's major faith traditions: Buddhism, Christianity, Hinduism, Islam, Sikhism, Judaism and secular humanism and rationalism. The Generation Z study ran between 2016 and 2018. To inform education policy, it aimed to investigate how teens make sense of the world and religious issues. The study explored teens' views on religious, spiritual, non-religious, cultural and sexual diversity in 21st-century Australia. In our survey, 56% of students attending government secondary schools and 42% of those attending independent private secondary schools said they hadn't had any diverse religion education or instruction in religious traditions. By comparison, 81% of students in Catholic secondary schools had received both. Our data suggest education about diverse religions is associated with reduced negative perceptions of religious minorities. 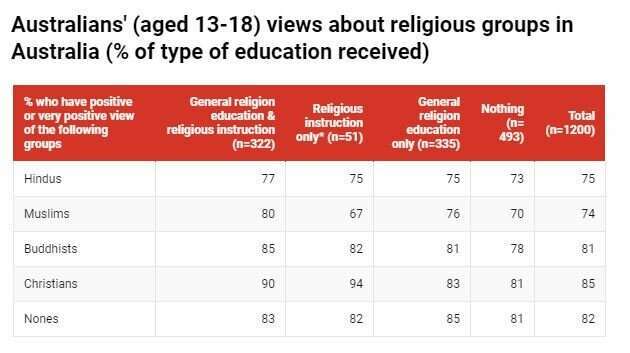 Students who had received this type of education had the most positive views towards Australia's religious minorities. Students who hadn't were about twice as likely to hold negative or neutral views. Gen Z teens who have had education about diverse religions overwhelmingly thought it helped them understand other people's religions (93%), that it helped make them more tolerant of other people's religions (86%), and that it was important to study these (82%). Of those who hadn't participated in such programs, 69% wanted to learn more about the world's religions, and 67% wanted more lessons on non-religious worldviews. We recommend the Australian Curriculum includes more education about diverse religious and non-religious worldviews in state, religious and independent schools. This would increase religious literacy and promote inter-religious understanding and respect among Australia's diverse religious and non-religious population. Religion and psychology: Can they work together? The art with that education is that it is performed by persons who have an objective enough stand, remaining factual when on one side educating about the reality and then as well as about the various beliefs. It is essential to teach our children respect and love for all fellow humans, no matter what origin they have and what belief they happen to stick to. And only when hearing about the basics of the religious doctrines it is possible to better understand in what dilemmas the various believers are trapped. Once educated, hefty criticism of the religions themselves must be allowed, as long as it does not directly offend and humiliate individual persons currently adhering to the specific cult. And as you bury your dead children, keep telling yourself that theirs is a religion of peace and that they really do want to accept western values of rule of law and individual freedom. Couldn't agree more, this article seems pretty stupid.